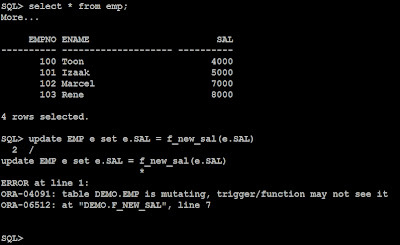 Triggers Considered Harmful, Considered Harmful: Look mom: a mutating table error without a trigger! 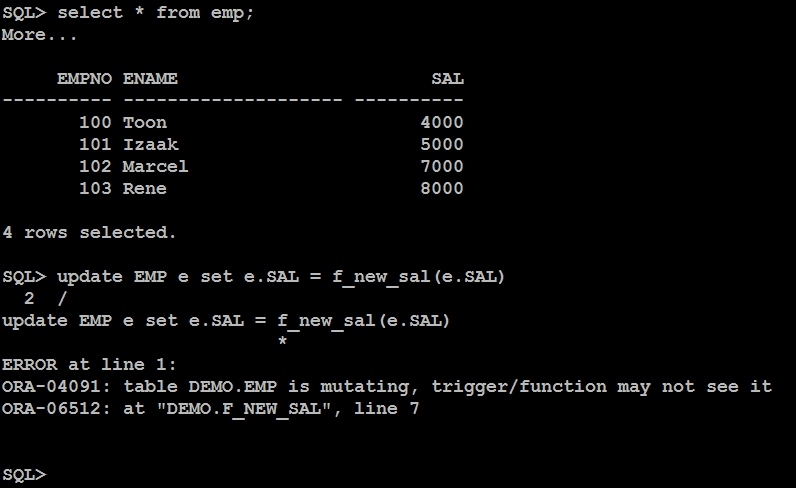 It runs well, HR confirms that it does what it was intended to do, and dba is fine with this in production. 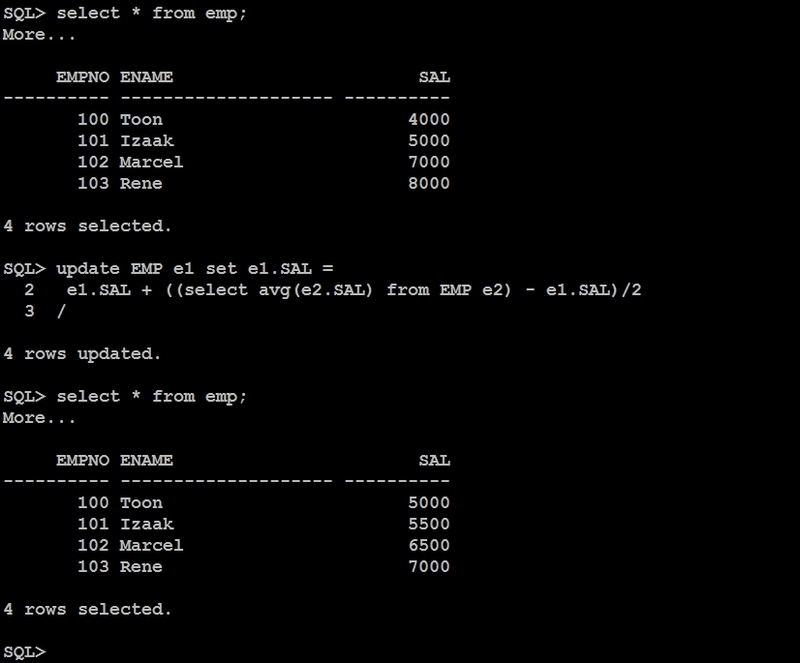 Our function queries the EMP table, which is currently mutating: bingo we hit the error. 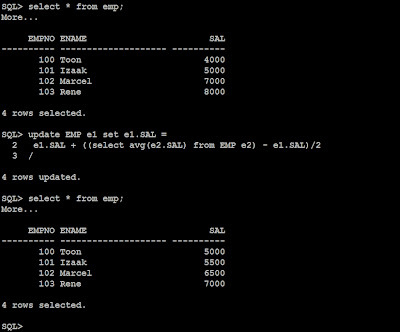 When Oracle steps out of the SQL-engine that's currently executing the update statement, and invokes the function, then this function -- just like an after row update trigger would -- sees the intermediate states of EMP as they exist during execution of the update statement. This implies that the return value of our function invocations heavily depend on the order in which the rows happen to be updated. from EMP@loopback; -- Here: added db-link. Now Rene's salary is the only one being updated correctly. So again, don't forget: ORA-04091 is your friend. 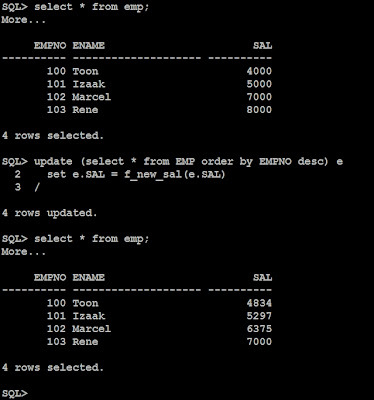 Note that in the original version of the update statement (without the function), Oracle ensures that the repeated 'invocations' of the subquery (select AVG(e2.SAL) etc.) 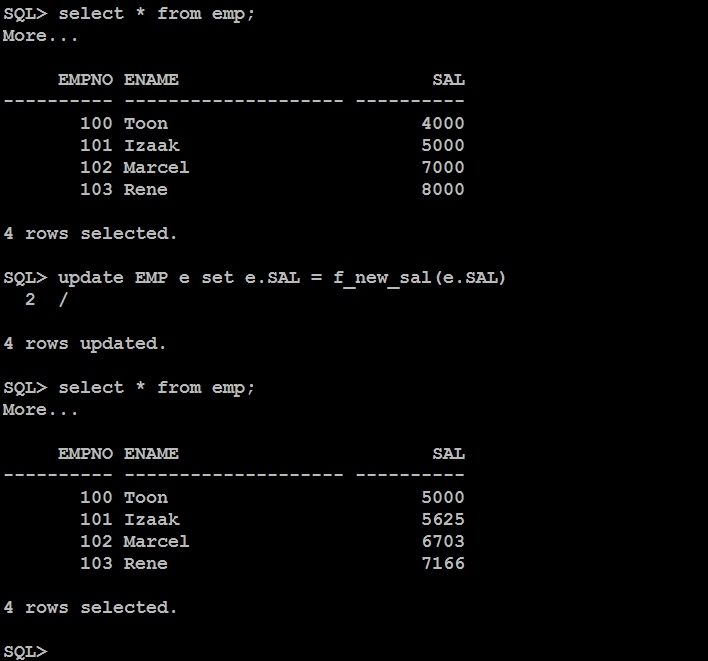 all see the same snapshot of the database: the one that existed at the start of the update statement. So there is no indeterministic behavior in that case. A fix for the issue demonstrated could be to just add the autonomous transaction pragma to the function. We would then get the same (deterministic) behavior as the original version of the update statement. A better fix in this case though would be to not have the function at all, and just go with the original update statement. 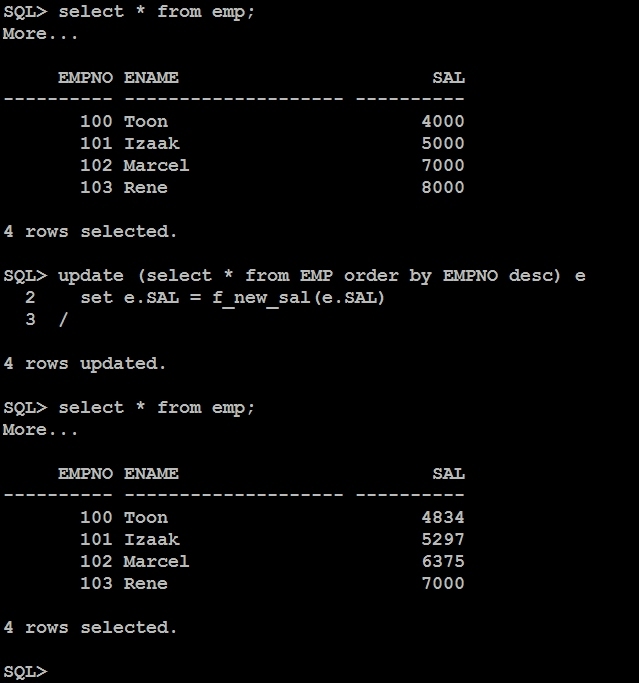 What [formal prescription] is it that causes the "SELECT AVG(...) ..." to be evaluated only once in the original SQL ? Did I say it was evaluated once? It might not be. Oracle ensures what is called "statement-level read consistency", which would cause repeated executions of that subquery to see the same snapshot of the database. It seems that Oracle does not consider the statements executed in the function as being an integral part of the update-statement. For if it did, these should also see the same snapshot of the database (the one that existed just prior to start of the update statement execution). 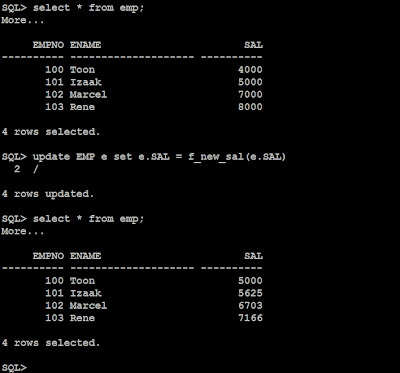 "[read consistency] Guarantees that the set of data seen by a statement is consistent with respect to a single point in time and does not change during statement execution (statement-level read consistency)"
One could argue why Oracle doesn't ensure this 'statement-level read consistency' for repeated function calls that appear inside a SQL statement. It could be considered a bug as far as I'm concerned. But this is the way it currently works. I guess my main point is actually this : while the title claims the talk is about triggers (SQL triggers), your proof/pudding seems to be about _Oracle_ SQL triggers. Not same thing !!! I've modified the description under the title. It now reflects that I'm talking about Oracle.